Over and over again it was exciting to set out and explore the apple tree gardens surrounding the village. Any path you might follow will amaze you by its stunning views and the life around you. It was lots of fun to meet the cheerful lady who lives high in the mountains. 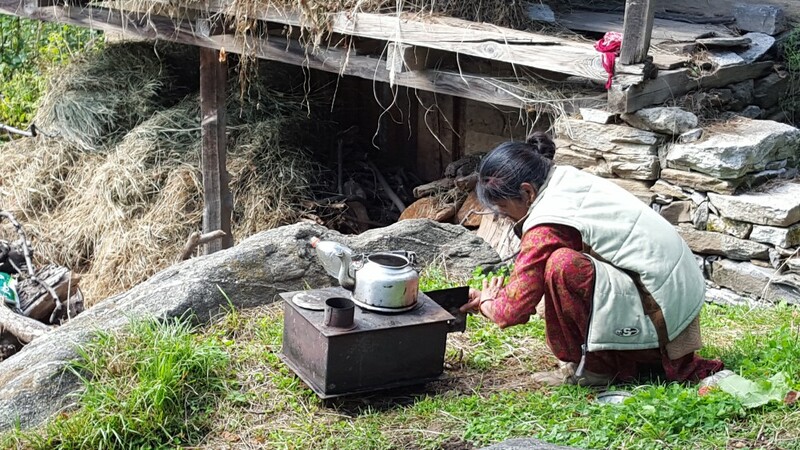 She invited us to drink a cup of chai cooked on here outdoor stove. On one of our walks we suddenly found ourselves in a gorgeous garden full of flowers. There we met Mr. Y. , the proud owner of this garden. Mr. Y. invited us to drink chai in his home. What a lovely home! There we sat on his porch overlooking the valley where the light turned blue. While telling his life stories we discovered he is a priest or shaman from the village. A very blessed and holly man. Our way down to the village was quite an adventure in the dark.